A perfect dress from the vampire family with 8x EXP effect for an hour. Right click to get 1 more hour of 8x EXP, when used with the Perfect Moonlight Dress. Returning players(Players who have not logged in for 30 days and were at least level 50 before Dec. 6th, 2017.) can do quest by themselves. If an old player is the team leader, other teammates can join them in taking the quest. A delicate dress from the vampire family. Use the Vampire Elite x5 to have 5x EXP points. A perfect dress from the Vampire. Use the Vampire Elite x8 to have 8x EXP points. 1. 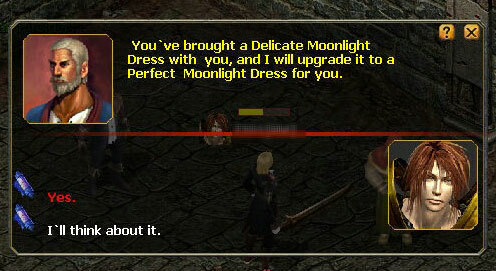 During the event time, if you are the returning player, you can claim a Delicate Moonlight Dress for free from Johnson. 2. Wear their Delicate Moonlight Dress or Perfect Moonlight Dress and enter the Penetralia once a day. 3. If you are the team leader, your whole team can go with you. 4. You can accept the quest once you enter the Penetralia. After leaving the Penetralia, the quest will be reset. 5. Once you've entered the Penetralia, find Charman to accept the quest. 6. You'll need to find Joseph, Grant, Engna, Hendy and Josh in the Penetralia and offer your blood to them. 7. 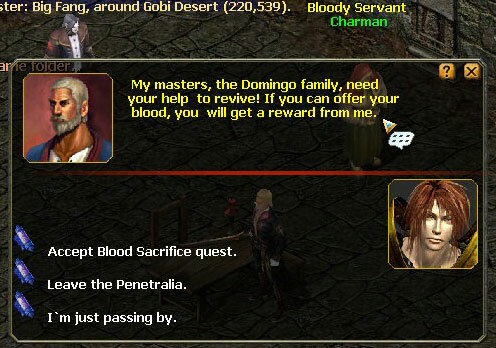 After offering the blood, head back and claim your reward from Charman. 8. You will get a 8x Vampire Elite or a Perfect Moonlight Dress as a reward. Senior players (Who haven't logged in for 30 days and were at least Level 50 before Dec. 6th, 2017) can find Johnson (Cronus 329,393) to claim a Delicate Moonlight Dress for free. Or you can get the Delicate Moonlight Dress from the quest "Vampire's Rebirth" from Gordon. If you are the team leader, your whole team can go with you. There is no time limitation for the teammates. Once you've entered the Penetralia, find Charman to accept the quest. 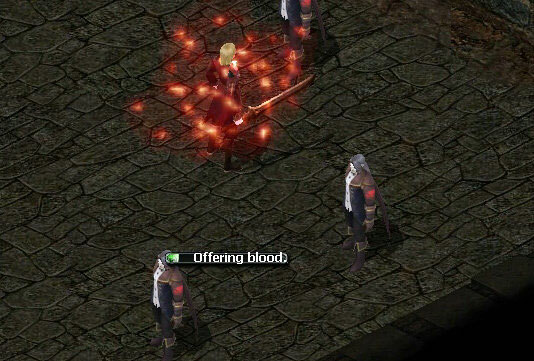 Find each Reborn Vampire: Joseph, Grant, Engna, Hendy and Josh and offer them your blood (Each costs 10% HP). Claim your reward from the Charman after you have completed the sacrifice.